Sweet words to ponder! Sweet words to hear! Sweet words to profess! As children, Valentine’s Day is a day for school parties, card exchanges and candy, lots of candy! Be Mine are just words stamped onto those pure sugar, heart-shaped candies allowed (by Mom) only on this special day! Scoot into those teenage years and those sweet little words, Be Mine, mean a whole lot more than candy hearts, especially from that special someone! But where was Valentine’s Day originated and what makes it such a special day in so many hearts? Contrary to popular belief, Cupid was not the creator of the day of love! One romantic legend is the one of St. Valentine of Rome who defied Emperor Claudius ll and helped Roman soldiers marry their love, saving them from having to go off to war! The wonder of romance and ‘falling in love’ was declared mysteriously wonderful as far back as Old Testament Days when Solomon penned, “There are three things too wonderful for me, actually four too lofty to understand: the way of an eagle in the sky, the way of a serpent on a rock, the way of a ship at sea, and the way of a man with a maiden.” Pr. 30: 18-19. Too lofty? Too wonderful? Perhaps! But, definitely worth pursuing and worth celebrating! Valentine’s Day is the second most popular day for couples to get engaged! Perhaps this Valentine’s Day there’s a surprise ‘drop to the knee’ declaration of love and promise of Happily Ever After waiting for you? “I Do’s”, and to call out Happy Forever After to so many couples! Reflecting on the year gone by, we are reminded that each season truly has its own beauty! Ahhh…Spring! Spring’s abundant fragrance, vibrant greens, and fresh air of excitement pale only to the love that’s in the air! Spring Fever indeed! Who couldn’t fall in love in Spring!? But, Oh….Summer Lovin’ is a given at The Brooks! Summer Lovin’ and warm breezes make beautiful music! Then just about the time Summer has cooked a bit too long, Texas’s true Wedding Season arrives! Autumn’s cooler temperatures and rich harvest hues make their way into many a bride’s dreams. Golden leaves dotting the brook and ponds and vibrant colors calling from the surrounding hillside, awaken the feel of romance for The Brook’s Fall Weddings! Of course, Winter and Holiday season has a glow all its own! Twilight comes early whispering Winter’s romantic feel. Can be just the perfect season to enjoy indoor and outdoor fireplaces and that big Texas bright starry sky! The Brooks at Weatherford their Wedding Place! We wish you a Merry Christmas, a wondrous Holiday season, and the Happiest of New Years! Steve and Tricia Heflin and The Brooks at Weatherford Staff! Do you have the case of the August Blues? It’s kind of like the Sunday Blues, but instead of dreading the beginning of the week, you’re feeling down as summer fades to an end. Thankfully, 360 West Weddings reminded us of Meagan Klansek and Brian Bordelon’s August 27th wedding from almost exactly two years ago. Looking back at their soft, summer wedding lifted our spirits in a heartbeat! Click the link below to be transported back to their wedding day, and your August Blues will turn into Summer Lovin’! 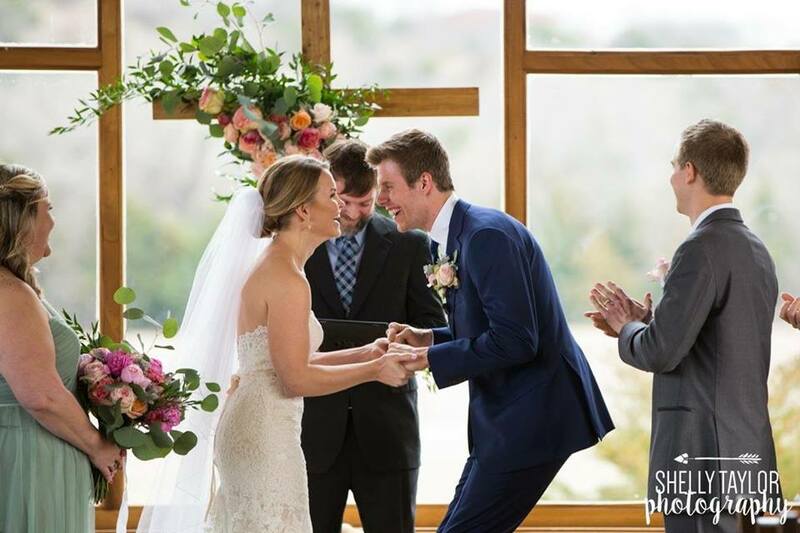 Thank you Colleen Stevenson and Nathan Dudley for choosing The Brooks at Weatherford as Your Wedding Place, and allowing us to feature your Wedding! What a beautiful, colorful, and love-filled day it was! The Brook’s Chapel, Reception Venue and surrounding grounds were designed to offer a beauty all their own. Situated next to rock encircled ponds, the chapel with its carved wooden pews, white timber trusses, wrought-iron chandeliers, and breathtaking view through 16 foot arched picture windows, offers couples a beautiful ceremony space and backdrop for adding as little or much decor as they deem fit. As well, the natural elements and earth tones of the Reception Venue’s cedar trunk posts, stained concrete floors, floor to ceiling rock fireplace and rock accented feature wall, provide a stunning, yet versatile space. Today’s couple, Colleen and Nathan, didn’t shy away from color! Violet, hot pink, orange, and blue were featured in bouquets, centerpieces, and floral arrangements. Their color choices were just as vibrant as their love story, told below in Colleen’s own words. The story of how we met is a familiar one. Nathan and I both started (veterinary) school together in the same class. We had mutual friends, which is how our paths initially crossed, and we started studying together and sharing notes. Our friendship grew, and we started placing bets on who would do better on tests and quizzes. Nathan eventually bet me dinner at a restaurant of the winner’s choosing. Naturally, Nathan told me that I bested him on the test (only he knows who actually did better! ), and that I was to pick where we were going to go. I procrastinated on picking a dinner location since I was nervous whether we would be going as friends or this would be our first date (I was hoping it would be a date!). Whilst I was procrastinating , Nathan came over to my house for pizza and a movie, and he told me how much he liked me. And the rest is history! Nathan asked me to come over to his place on a Friday so we could work on a project for school together. I told him that would be fine, I just had a riding lesson that afternoon so I wouldn’t be over until about 5 or 5:30. He said that would work for him since he wanted to run a few errands before I came over, so off to the barn I went! It was one of those freak warm days in February, so my pony got extra sweaty during the lesson (meaning I had to wait until he was cool to let him back out in the pasture). When Nathan texted me around 4:30 asking when I would be over to his place, my pony was still steaming through his cooler, so I told Nathan I wouldn’t be leaving the barn until at least 5. As fate would have it, I was leaving the barn at closer to 5:30. I rushed home, let the dogs out quickly, threw on a change of clothes, and headed for Nathan’s (feeling terrible that it was so much later than I had originally thought, but getting hungry!). Nathan didn’t greet me at the door, which was a little odd but not unheard of, and as soon as I walked into his house I knew what was about to happen: the lights were off, little tea candles everywhere, and still no Nathan. I dropped my shoes and backpack at the door (I still thought we were doing homework when I left my place), and walked into the main room. I saw camera flashes coming from the kitchen (Nathan had thoughtfully asked two of our friends from school to come and take pictures), and Nathan came and took me by the hands a lead me over to a display that he had made of things meaningful to us. He then told me some very adorable and heartfelt words, while I struggled not to cry (I figured if I started crying, Nathan would too, so I did my best to hold it together!). Then he got down on one knee, pulled a beautiful ring from his pocket, and asked me to marry him! Of course I said yes! We took a moment to celebrate with our friends with a bottle of champagne and cake. Then, Nathan and I were off to check on our sheep for vet school. We called our parents on the way to the school to let them know the good news! After, we headed out to a lovely dinner! Their June 16 celebration was absolutely beautiful; the energy level was high all evening and smiles never ceased. What a great team came together to make Nathan and Colleen’s Day picture-perfect and a treasured forever memory! Justine’s Flowers created vividly colorful and eye-catching arrangements, centerpieces and focal pieces. A beautiful spray of flowers graced the Chapel gates, being one of the first decorations guests encountered. After the ceremony, guests enjoyed delicious Magdalena’s cuisine from appetizers at cocktail hour to the beautifully displayed and wonderfully delicious dinner. Gorgeous table settings provided by Grand Events provided an elegant touch. Le Force Entertainment’s Cratin Sheffield, kept the evening flowing, energy level high, and guests dancing, and enjoying the celebration. Lori Lynn Photography was sure to capture it all from start to beautiful rose petal finish! This beautiful day, joyful and fun-filled evening wrapped up with a romantic send off of rose petals floating around this sweet couple. Love; sweetly celebrated! Thank you, Colleen and Nathan, for letting us share your story and share in your beautiful Wedding Day! We wish you the happiest of ever afters, Mr. and Mrs. Dudley! A special thanks goes out to everyone who helped make their day possible, it’s a joy getting to work with such great industry professionals! We at The Brooks, are honored that couples choose our chapel to commit their lives to one another! What an honor to witness the beginning of their forever after! We love to see each couple’s personalities shine as they transform our place and space to be uniquely theirs, from the meaningful “I do’s” to the grand send off! Such an important, special, greatly planned for celebration, and life marker kind of event, begs a great ending or ‘grand exit’! Traditionally, rice or birdseed was thrown toward the newly wedded couple as they ran to their decorated ‘get away car.’ As being pelted with rice or having one’s hair becoming fair game for hungry birds lost its former appeal, new traditions and creative options emerged. A modern day toss can include lavender or dried herbs, rose petals, even biodegradable confetti. Bubbles and sparklers make for fun and striking alternatives. Have guests light up the night with glow sticks, or wave personalized hankies. Maybe you and your new wife/hubby had a long distance relationship. Pay tribute to your time apart by walking under a flock of paper airplanes! If husband and/or wife is military, walking through the Military Sabor Arch made by uniformed Comrads, honors both couple and country! We’ve seen many unique exits! From a line of beautiful sparklers leading to limos, vintage cars, even buggies! To jingle bells, cow bells, fireworks, and yes, even helicopters carting off the newlyweds to unchartered heights of life! Wedding Day is indeed a ‘life-marker’ moment! Love worth commiting to, saying “Yes” to, is worth celebrating! And the send off is that final “Yes! Here we go! Let’s do this thing!” It’s the walk through the sea (or fewer) of faces that have actually stayed to the end of your Wedding, and the faces who’ll be rooting for you throughout life as well! Oh the places you’ll go, the experiences you’ll have as you journey life together. Create a Grand exit for this new beginning? … Absolutely! Enjoy these fun, beautiful “And there they go” captures! We’re so excited to feature the Wedding and story of recent bride and groom: Tara Upshaw and Justin Gaddis! May 12 was ‘tie the knot” Day for newlyweds Justin and Tara Gaddis. 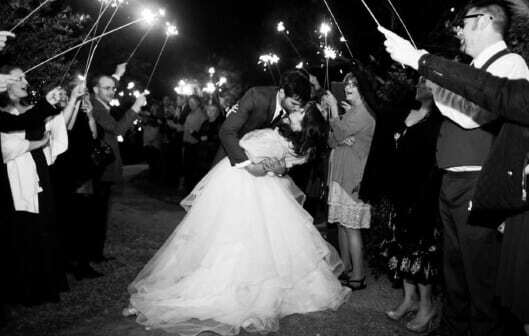 Their wedding portrayed not only their love, but their personalities. From the moment they arrived at The Brooks to the moment they ‘took off’ on their grand helicopter exit, this couple was all smiles! Before sharing the details of their big day, we’ll tell you a bit about these newlyweds in Tara’s own words. Justin and I met for the first time at Brewed. I walked up to Brewed, and found Justin wearing an old school Kentucky basketball sweatshirt and instantly fell in love. We conversed over some coffee, and both asked each other several questions to get to know one another. At first, I was taken back by Justin’s intense conversational style, but I loved his endearing sense of humor. Neither of us wanted the date to end, so we went to the Bearded Lady and continued talking about everything from childhood to our individual dreams of the future. Little did we know those dreams would soon be “our dreams.” The date ended with our first kiss and me calling my mom to tell her I found the perfect man! We have been inseparable ever since, spending only a handful of days apart. Best of all, we went back to Brewed for our rehearsal dinner and we are closing on a house a few blocks down the street! On a steamy Sunday morning in July, we planned to have a picnic before Church. I did not think much of it, other than it was a bit peculiar to have a picnic at 9 am. Nonetheless, Justin found us a spot in the shade and set up the picnic blanket. He told me where to sit and was insistent on it, which at the time I remember thinking he was being a bit demanding (I found out he wanted my back to the action!). I can hardly remember what we chatted about, but I do remember thinking we were going to be late for church! I also made a few comments about a sweet family taking pictures of their little boy all around us. We picked everything up and started making our way toward the steps when Justin stopped and told me the family was not taking pictures of their boy, and then he got down on one knee! I wish I remembered what he said, but I just remember crying, hugging, and wondering if I should grab the ring out of the box! After he asked me to marry him, cheering erupted from the trellis atop the stairs. I looked up and saw my entire family cheering and waving! Justin pulled off the biggest surprise of my life and had my whole family in on the secret, which meant the world to me! If you are Brooks Bride-to-be, or just looking for some wedding inspiration, The Gaddis’s taste in decor may lend you some great ideas. Justine’s Flowers dressed up the chapel by highlighting the beauty of spring with soft blush, but allowed Tara and Justin’s personalities to shine by adding pops of bright coral that was a great accent to the men’s blue suits. During the ceremony, guests dined on Blue Mesa, then danced the night away to the sounds of Le Force Entertainment. Just like the couple, the guest were there to celebrate! Everyone seemed to join the fun, dancing and laughing and sharing a smile with one another. Cakes remain a focus and the cake table is still an eye catcher at Weddings. The simple backdrop made of picture frames, greenery, and touch of floral truly transformed the space and added to Ruth Robbin’s four tiered cake creation. Following their final Private Dance in the chapel, Tara and Justin exited under a canopy of sparklers, then really lit up the night with their helicopter exit flown by Tara’s Uncle. Mr. and Mrs. Justin Gaddis! A special thank’s goes out to all the vendors who made Tara and Justin’s day possible, and made The Brooks at Weatherford just how they’ve always dreamed. Ahhh…June! Summer Vacation, Warm Weather, and Wedding Season! To be a “June Bride”, that’s the dream isn’t it? The month of June derives its name from Juno, Roman mythology’s goddess of marriage. It was thought that couples who married in June would be blessed with prosperity and happiness. Others chose June in order to time conception so pregnancy, and births wouldn’t interfere with planting and harvest work. (Ah, life on the farm!) For most of us, gone are the days of planning one’s life and Wedding around harvest! Thank goodness for modern weddings (and indoor plumbing), am I right? While June may celebrate the goddess of marriage (when in Rome), it celebrates some very special people in our lives as well, Fathers! Pair that with June Bride thoughts and we’ve got a wonderful thing to celebrate indeed: Father of the Bride! As a bride, they’re the man you loved first, they give you away to be a wife, and a Tim McGraw says, you’re always their little girl. Wedding Day conjures up much emotion for everyone, but the Father of the Bride typically experiences more emotion than he bargained for! He’s the one that loved her first, after all! We, at The Brooks at Weatherford, have loved being witness to the precious Dad/Daughter experiences of walking the bride path and, of course, ‘down the aisle’, the Dad/Daughter dance, and the Dad’s toast and charge to the couple! Yes, we’ve seen smiles, cheek kisses and tears, But, hey, to be a cherished daughter….. nothin’ better! June Brides, we are so honored to be a part of your Dream Day; Wedding Day! And, Fathers of the Brides, we appreciate you! To Celebrate that Dad/Daughter connection, we’re sharing a few snapshots of Brides with their Dad’s at The Brooks! Enjoy, and Happy Father’s Day! Spring has sprung! In Texas, the telltale signs are wildflowers lining our highways and scattered through our fields. The vibrant bluebonnets have us remembering Julia and Robin Carrington’s charming southern wedding here at The Brooks last June. Relive the memory by visiting the Trendy Bride Blog. The Brooks is honored to be featured in Trendy Bride Magazine. We applaud Lauren Brandon Photography, Borrowed and Blue Occasions, and Oh Deery Florals; just a few of the team that helped make Julia and Robin’s Wedding Day picture perfect! Beautiful spring weddings abound at The Brooks! Visit our Facebook page for more. What a beautiful fun filled Spring! We are so blessed by the couples choosing to start their lives together at The Brooks! One such couple is sweet Kyle and Bailey Voss, our April Fool’s Day (2016) couple! Cover photo credit to Rebecca Ellison Photography. Thank you for visiting our blog! If you would like to receive more information about booking your next event with us, please visit the Contact page. 2018! What a Wonderful and “Weddingful” Year! Love is in the Air… No Foolin! That Fallin’ in Love Thing! What can we say, but THANK YOU?! The Brooks’ Hard Hat Pre Opening Tour! The Brooks first Bridal Show Experience!! Brides love The Brooks! Photographers love The Brooks! Couple are Falling in Love with the Brooks… before we’re even open! Build Update #3 – Coming to life! Build Update #2 – Here we go!